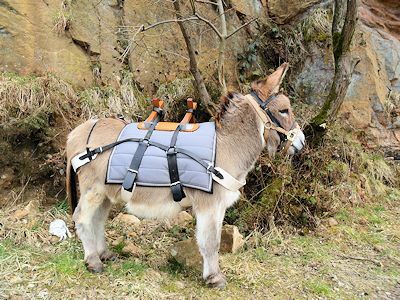 Trekking and packing is a wonderful way to get out in the countryside and explore the many bridle paths in the company of your long eared friend. Whichever type of packing/trekking you are considering, some sort of saddle is needed. Saddle panniers must be of equal weight before loading onto your animal. Pack saddles are expensive items of equipment and not necessary for a gentle stroll but spine clearance is absolutely vital for an animal carrying any weight on its back. 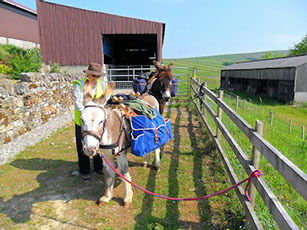 Donkeys should not pack more than 20% of their bodyweight and that includes the packsaddle and rigging. Proper packsaddles are needed when carrying heavier packs over difficult, hilly terrain for long distances. Leather boots are essential in an emergency situation, such as if donkey gets footsore and you are miles from anywhere, you can at least get back to your transport or to your destination. 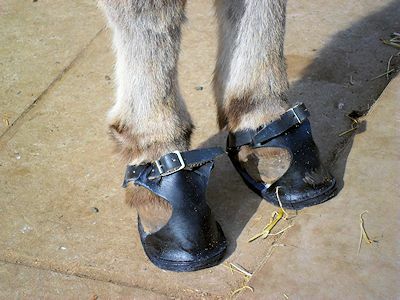 An equiboot/easyboot is the wrong shape for the donkey’s foot and will not stay on. 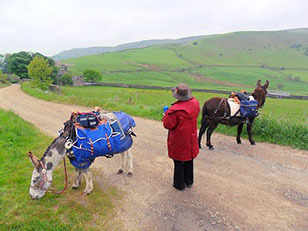 The donkey should be used to wearing a well-fitting bridle and bit (This gives the handler greater control) and a Hi Viz tabard is required for yourself. A comfortable head collar on top of the bridle and extra-long lead rope are also essential, in addition to details of your current public liability insurance and your donkey’s passport. Take advantage of water troughs/streams on route to offer water to your donkey. First aid kit for donkey & human to include: plasters, vet gamgee, equiwrap, sudocreme, horseshoe nail to dig out tiny bits of grit, hoof pick, leather emergency boot, blister pack.